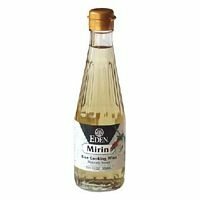 Create flavorful dishes with Eden Mirin Rice Cooking Wine. Just a few shakes of this popular staple in Japanese cuisine adds a delicate taste to dashi broth, soups, sauces, stir-fries, dips, marinades and dressings. The versatile ingredient is also ideal for making glazes for your favorite grilled and baked foods.